ChiIL Mama : Win Free Tickets to The Houdini Box at Chicago Children's Theatre! Win Free Tickets to The Houdini Box at Chicago Children's Theatre! 1 pair of tickets to Chicago Bluegrass & Blues Fest--Lisa L. Click the link above for our original photo filled coverage from 2011, band info, the 2012 line up, main site and more. **Remember: KIDS UNDER 12 ARE ADMITTED FREE TO THE CONGRESS THEATRE CHICAGO BLUEGRASS & BLUES FEST SHOWS WITH A PAYING ADULT!! ChiIL Mama will be upstairs with our free Rock N Roll Photo Booth, Instrument Petting Zoo & brand new HOLOGRAPHIC ChiIL Mama buttons! Free family 4 pack--enter here to win--2 days only! Winner announced Friday at noon. & a pair of (18+) tickets to see Clip Art at Schubas. Our winners will be announced this Friday at noon. If you're a fan of children's literature but not already familiar with children's author and illustrator Brian Selznick, all of that is about to change. Selznick's 2008 Caldecott Award-winning book, The Invention of Hugo Cabret, debuted last November as Academy Award-winning director Martin Scorsese's first 3D family film Hugo, and was just nominated for 11 Academy Awards including Best Picture. Meanwhile, Selznick's newest children's graphic novel, Wonderstruck, was recently published by Scholastic Books to rave reviews. 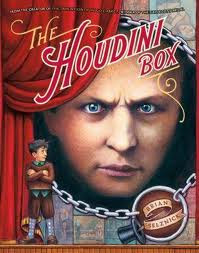 And now, the Brian Selznick trifecta continues right here in Chicago when Chicago Children's Theatre unleashes The Houdini Box, a world premiere musical adventure based on Selznick's popular first novel about a mischievous boy who receives a special box that just might contain the secrets of Harry Houdini's success. 1 (18+) pair of tickets to the final Monday of Clip Art's residency at Schubas. Last night, we had a Lara Miller fashion press event, then we hit Empty Bottle to see Otter Petter, Mutts, Pinto & The Bean, & Wally Dogger. However, our ticket winners told us Clip Art put on a phenomenal show. She said, "Andy did a killer, acapella version of the Tom Waits song, "I'll Be Gone" from Frank's Wild Years. It was fantastic! The also covered The Kinks and The Shins. Tina Howe sat in on a couple of songs, as did Jessie from JC Brooks and The Uptown Sound and Cosmos." Family 4 pack to Cirque Du Soliel's Quidam! We often add new shows as the months progress and have some great stuff in store for February. So come ChiIL Out with ChiIL Mama, check back frequently, and enter like we vote in Chi, IL...early and often. *Wait for Rafflecopter to load up right here (if you've gone through RSS feed or are scrolling down the blog and don't see it, click on the actual page title and it should pop right up). It's easy to enter and so much fun to win.